Dysart has been going as a setter for about four years now, and has had puzzles in all the major series. His last Listener was based on “The Times They Are A-Changin'” by Bob Dylan and was very enjoyable. Except that I made a mistake, stupidly anagramming GEARING into NAGREIN instead of GAGREIN. Knowing that it was a horsey term meant that nagrein made it through my rechecking process unscathed! Hopefully this puzzle will be as enjoyable but without the silly error. There are two sets of thematic clues, and all the others have a misprint in the definition, with the incorrect letter spelling out an instruction. This will need careful attention as it is normal for the correct letters to be the important ones. Acrosses first then. 1ac an anagram of NEARLY without the last letter of deer; it doesn’t take long to get LEANY (Spencer’s land/lank). 9ac’s energy (E) and life (VITA) leads to the stale/stage play. At 24 TA (volunteers, getting very hackneyed) and K-something rings a bell for a disreputable house leading to TAKEN for punched/pinched. The only trouble with using the incorrect letters is that some of them stick out like a sore thumb: ‘sing of wagons’, ‘Welter’s shelter’, and ‘one of two shaving’ quickly give S, E, and V. Not that I’m complaining at the moment since I’ve got the thematic clues and a bit of artwork coming up which could take a bit of time for all I know. The downs also start well, with 1 being LENTI and 3dn, beginning YA, pretty soon yielding YACCA (Y replacing D in DACCA). 11dn is an anagram of IN A O (circle), and NAOI must be the plural of NAOS, but I can’t find it in Chambers, which is strange. Next comes PLAY AT with a theatrical clue, although ‘just for Shaw’ can’t disguise the misprint for ‘show’, and lastly EASED and KRAALS, the K from TAKEN helping to spot ARK as the overturned vessel. So, not many clues really, but quite a few letters guessed from the misprints. So far I’ve got SEVENTY and MA.IC…T which means we may have 70 or so MAGIC LETTERS, whatever they may be! A quick look at the thematic clues, and a bit of letter randomising gives COMPANION at (i), and Bradford’s helps get VIPER at (a). That’s all I can get, since there are no definitions, and nothing else springs to mind. I manage to fill the grid at about my average Listener pace, not too quick, not too slow. The misprints finally give me DELETE ALL BUT SEVENTY FIVE THEMATIC LETTERS … so much for another MAGIC square puzzle. I don’t know if you remember my agony over Waterloo’s fiDlEDE, but one of the reasons I used to rationalise not having to make changes to the grid after I completed it was that there was no “solvers should initially use a pencil” warning. And here we are, barely a month later, and there’s no such warning but we are being told to delete half the diagram! I’m assuming therefore that anyone completing their only copy of the diagram in ink is justified in scrawling through the non-thematic letters. What messes did John Green receive? Anyway, back to the thematic clues, and I don’t know why I didn’t see NAGAsake (Japanese city minus its alcoolic drink) first time round. Hey presto, it looks like all the acrosses are snakes, and the theme finally dawns. Better late than never. So the set 2 themes must be ladders, which should go straight up or diagonally in the grid unlike the wiggly snakes. It doesn’t take long to find them all, but sorting out the clue for STY takes a minute or two (Yeasty in the past this would be frothy with YEA plus STY being frothy). Unfortunately, adding up the number of letters in the theme words gives 74 of the blighters! It takes about fifteen minutes to spot my mistake: I have ANACONDA ending on the first letter of ASP, which I guess is a no-no, although I don’t see why a snake can’t run into another, enabling you to start your downward journey in two places, a long trip from the top or a shorter one from the middle. Since there’s no reason why a snake cannot go up at some point in its journey, long as it ends up below its starting point (as RACER does), so I’m assuming that ANACONDA uses the A in row 5 to finish. I’ll be mighty sore if this logic is wrong! Oh no, I’m filled with self-doubt again. All that’s left now is to draw the snakes and ladders. I’m sort of surprised that the non-thematic letters were required to be deleted. 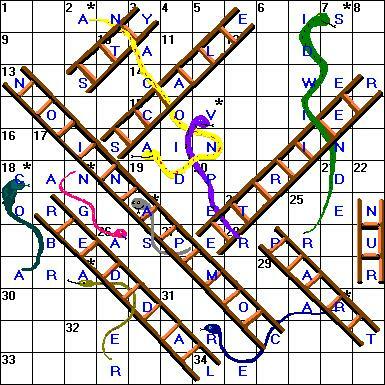 It would have made more sense to delete the thematic letters and then draw the snakes and ladders in through the empty squares. According to the preamble, the drawing must distinguish the key features of the grid components. It would be easy just to draw straight lines for the ladders and squiggly lines for the snakes. Luckily, Shirley’s lovely diagrams for her blogs convince me to draw the ladders as double lines with a few rungs, and the snakes as double lines with a tail, mouth and forked tongue. How much (or little) flair is required to fulfil the instruction in the preamble? The solution will no doubt make it clear. Shirley will probably have some fabulous creatures writhing across her diagram. So, a good puzzle from Dysart that was well-constructed and entertaining despite my little niggle about the misprinted letters. HOWEVER … the clue to 27dn, Duke informally grabs a bottle (that could contain rose drops) leads to PHIAL … A in PHIL!! We may have to wait a few years before the next Dysart puzzle, unless they allow him his copy of Chambers in the Tower of London! A relative newcomer with this Dysart’s fourth Listener since 2007, all well received so far. My favourite had been the second, Mercury’s Whereabouts, and I remember being slightly critical of the last, Songspiel, where two thematic entries in the grid overlapped directly (Bob Dylan and anziani) – at best unorthodox, it was a construction that somewhat marred the puzzle for me. Child’s Play turned out to be just that, a straightforward crossword and then we got the paintboxes out! The theme was discovered sooner than I would prefer when asp was found to fit Wife leaves spiteful person in Set 1 and all of Set 2 could be found under ladder in Chambers Crossword Dictionary (it will be a terrible shame if this book is never to be updated). Only one clue gave any trouble and that was justifying the plural of naos as naoi at 11dn. It is neither in Chambers nor the OED while Chambers Words (1985) only gives the (anglicised?) plural naoses. However, Chambers Word Wizard allows both plurals while naoi is found in The New Oxford (1998) and Collins (1998). I don’t know if S to I constitutes a regular Greek plural but octopi (apparently allowed in US dictionaries) is frowned upon by Chambers and purists. Delete all but seventy-five thematic letters. I used MS Paint for my artwork and eagerly await Shirley’s hand-drawn version that should be appearing hereabouts. Although we always go up ladders and down snakes, I didn’t know if the snakes should be drawn with the head above the tail or vice versa. The Net shows boards with the snakes going either way or both so I used both too. Usually the descent of each snake is continuous so that the rise at the end of anaconda and racer would not be seen. This might have confused some solvers but no complaints from me. 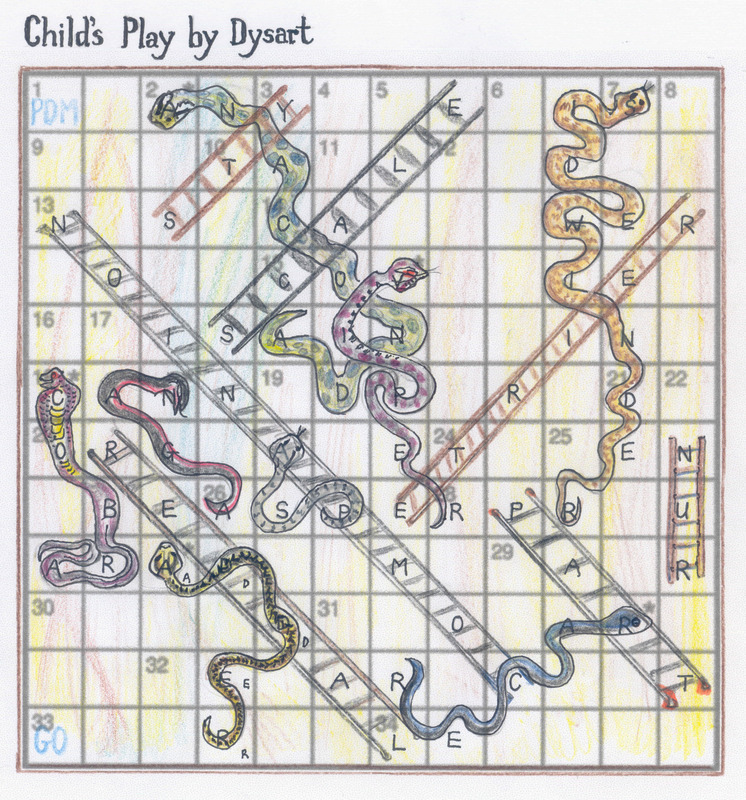 So, to sum up, this was probably a bit too lightweight to feature among the favourite Listeners of 2009 but I fancy that there will be very few solvers who will ever forget the week that we were required to draw the Snakes & Ladders board. Thanks for that Dysart and I appreciate that it must have taken a considerable time to fit everything in without ambiguities, especially the snakes. Whirly-Birly by Sabre – stiff drinks! The Junior 8X8 team was gaining confidence but when we downloaded this one and read the word ‘jumbled’ followed by the word ‘encoded’ we were nonplussed. Then we noticed that ten of the answers were ‘thematic’. Despair! 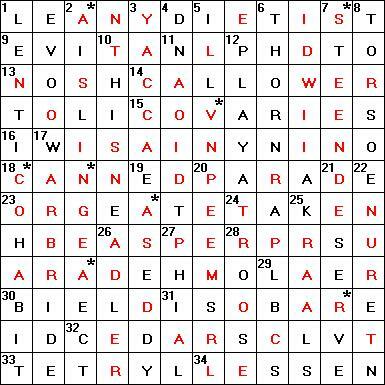 We wondered aloud whether Listener crosswords should come with letters A to F according to difficulty – just to warn off the beginners. A stiff drink was called for! I got out my colours and coloured in the sets of four (two normal, one jumbled, one encoded) – but that just turned into a confused and useless tartan hotchpotch that masked even the clues we solved – abandon that! We set to and were surprised when, by the end of the evening we had solved two-thirds of the clues. Great, straight-forward clueing gave us EMPRESS, PODEX, NEODYMIUM, WIT, MARYBUD, PLAIDMAN, EIGNE, ANNATES, STRESSING OUT and most of the down clues: FERNYTICKLES, AMEER, IPSO, URI, KENYA, PSAMMOPHILES, STUDDINGSAIL, REALTOR, BREEDINGS, V-SHAPES, REIGN, CRIES, SOMA and GED. It was easy enough to identify most of those that had to go in normally, because of useful intersecting words, and it was obvious that GED and SOMA had to be jumbles. We could even work out how MARYBUD had to be jumbled to fit with existing words but this is where inexperience brought us to a standstill. Problem no. 1 – half a dozen words to be entered normally that we couldn’t even find because of our lack of skill. For an entire day, we laboured towards INDISPUTABLE. Of course, it came up as one of the few possible words in a number of word-finding programmes but who would have thought it could mean ‘liquid’? EPAULET, RAISE CAIN and INHIBIT are obvious solutions (once you have them) but they evaded us until we had the help of a superior solver. And HECHS? Yes, it is obvious that HES have to go round CH(ina) but we wasted lots of time hunting for the obvious. Problem no. 2 – CRIES and ANNATES clearly had to be coded but what about the Es of the two words that intersected with each other? The preamble stated very clearly that no letter was encoded to itself (later on that condemned to the bin a putative ‘FIRST AUSLESE’ which, in a nasty linguistic jumble, looked like fitting in at 1ac – of course the F of FERNYTICKLES couldn’t be the code for the F of First – it was the K of KIRSCHWASSER). We were able to sort out roughly which of the remaining solutions were to be jumbles and which to be encoded but we created out own problem no. 3. BRANDY PAWNEE seemed to go into 23ac and give us some of the remaining code letters that we needed, (especially that elusive W) but I was convinced that 21d was going to be a jumble of BURGUNDY – that clashed! And so did SLIVOVITZ at 9d. Oh, clever Sabre! It’s the alternative spelling of SLIVOWITZ – and stupid me! Of course, 10d is jumbled BURGUNDY and 21d produces an encoded SAUTERNE. Time for a celebration cup which we raised to all you solvers who manage mental gymnastics like this in a couple of hours and to the remarkable mind of a genius who can set something like this. Cheers, Sabre! Two things with this puzzle: number one, it’s by Sabre, so a shiver runs down my spine, and number two, what the hell is Whirly-Birly? Chambers gives ‘birl’, a verb meaning to ply with drink, so we’ll see. Sabre had an identically structured puzzle back in 2004, 3799: Fireworks. The theme then was volcanoes and I managed to finish it although it was a bit of a struggle. In each set of four symmetrically placed answers, two are entered normally, one jumbled, and one in code. Plus there are ten thematic entries, each of which can be entered using one of the three methods. Some people have a problem (ie whinge) about jumbled entries, but I think of them as a setter’s valid attempts to make our weekly adventure that little bit more exciting. Personally I don’t like Playfairs, but you won’t find me moaning about them (not this week anyway). A quick pass through the clues reveals a surprising number of answers. The first is for the sandy areas AREG, a favourite word of mine although I never owned an A-reg car. 17ac is an excellent clue, an anagram of YOU MIND ME … ‘turning silvery grey at 60’ leading to NEODYMIUM, atomic number 60. 19ac WIT, 32ac RAISE CAIN, and 37ac EIGNE (First-born’s regularly weeing in bed), and I’m off to a flying start. Not that they can be entered in anything other than a light pencil yet. Ann Widdecombe stumps me for a bit as I thought her name was Anne (all these variations on names are a pain, especially come Christmas card time!). Anyway, I get ANNATES at 38ac and manage OUTSTRESSING across the bottom; except it’s two words, so let’s go with STRESSING OUT. All in all, not a bad start. Unfortunately, the down clues are a bit more recalcitrant. There’s the canton of URI, STUD-something-AILS leading to STUDDING SAILS, and an anagram of BIRDS GENE meaning pedigrees, or an anagram of PEDIGREES meaning bird’s gene: I guess correctly, and BREEDINGS is quickly unravelled. Breeding is a word that is not normally pluralised in everyday speech. Anyone who watches Countdown (and I haven’t for ages, pretty much since RW left the scene) will know that some plurals are disallowed by being designated ‘mass’ nouns by Collins, their dictionary of choice. I wish Chambers had this feature. Anyone reading this blog, and wishing to know other setters and solvers views on Pluralisation, is advised to visit the The Crossword Centre Message Board. Most of the debate is about things like whether ‘nine year olds’ should have none, one or two hyphens, but Roddy Forman’s post on November 13 headed “Re(2): Pluralisability” talks about ‘mass’ and ‘count’ nouns. For a Sabre puzzle, I cruise along at a satisfactory rate, and even find the code fairly easy to decipher. I’m afraid I didn’t make detailed notes of exactly how I deduced all of the code; perhaps Erwin will oblige (although he’s probably getting some rest in preparation for next week’s numerical). I’m also unsure of when the theme was revealed to me. It’s nice to know that my first examination of the title or preamble was in some way correct, although it didn’t help much really. Yes … it is alcohol. The three clues that stumped me the longest (or at least had me struggling with the wordplay) were EPAULET (terms of the peace pact referring to their last letters), CRIES (don’t ask! ), and PODEX (I was convinced that rear entrances was an indication of last letters, and I’d never heard of PX, short for post exchange, the US equivalent of the NAAFI). A good puzzle, as usual, from Sabre with a few tricky clues, and a framework that I’m sure we’ll see again. And finally, a quick update on the checking of my Listener entries for this year: now up to 4055, with an all-correct run of 44 going back to December.